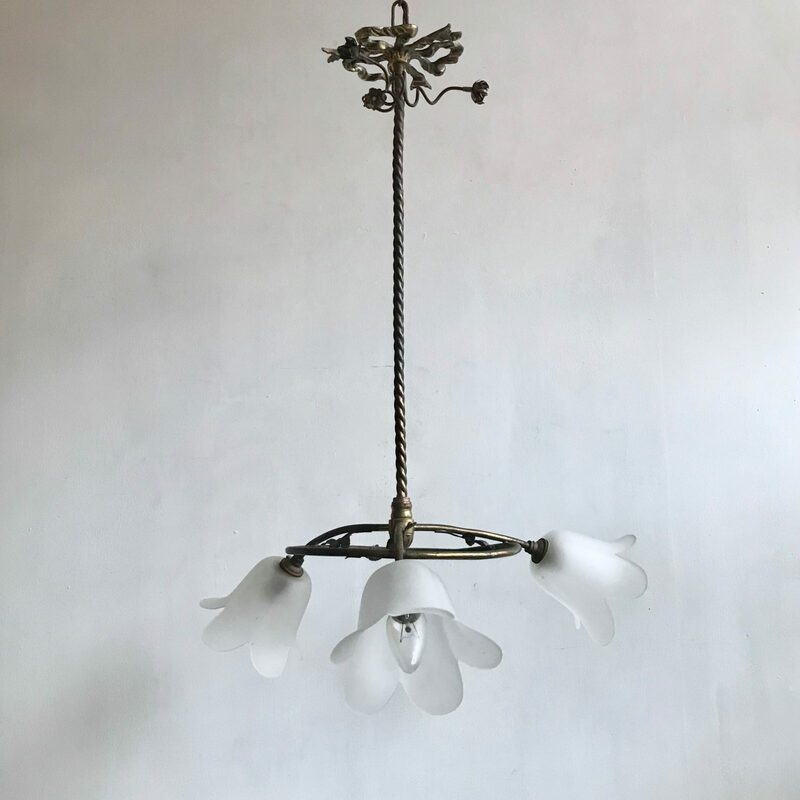 A decorative floral brass chandelier with frosted tulip shades. The circular frame is decorated with delicate pressed brass leaves which form the arms leading to the lamp holders and frosted glass tulip shaped shades. The long stem is twisted leading to a decorative rose and three twirling brass rods leading to a single rose. The patina on the metal work has largely retained a polished finish with the indents mostly darker. The chandelier comes supplied with braided flex, chain, a ceiling rose and a chandelier hook plate. Chandelier requires three B15 lamps, these are not included. Wiring can be adapted accordingly for other countries. This chandelier has been fully restored and rewired here, in Stockport, near Manchester by our small team of experts and is now ready to be installed. We recommend that this large brass chandelier is installed by an electrician and into a joist or a supporting noggin. To clean the ornate brass chandelier dust the brass components regularly with a soft cloth. The crystal can then be wiped with a glass wipe or a cloth that has been sprayed with glass cleaner. A final wipe with a paper towel will give a polished finish.